So far, I've tried to avoid posting stuff on TRS that's available on other blogs -- hence the name of this blog! If it was something I got from another source, but that blog or its links were no longer active, I've re-upped and posted it here. But as far as the boots that are still sitting out there in some blogosphere backwaters, it occurred to me that, even though I myself have spent wayyy too many hours scouring the 'net for obscure recordings of my favorite artists, that doesn't mean that other interested parties know they're out there. So I'm starting a series of posts pointing you to other blogs you might not stumble across, and you can follow their links to the files in question. While you're there, scout the rest of their blogs out, and if you like, tell 'em I sent ya! Today, two wonderful recordings from artists I was amazed to find had even been bootlegged at all (kinda like when I found the Mary Margaret O'Hara boot I posted). 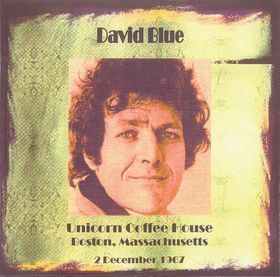 First, from back in '67, we have Dylan cohort David Blue at Boston's Unicorn Coffee House. The sound is a bit fuzzy but amazing for a tape of that vintage. And whatever it lacks in clarity, the show is ESSENTIAL for anyone who likes Blue at all, even if all you like his one undeniably great song, "These 23 Days in September" -- because this is the DEFINITIVE RECORDING of that one. The titular album version is good and atmospheric, if a bit too brooding overall. His later remake is pointless in the extreme. Some cover versions have been nice, but not quite perfect. But here, backed by some of New York folk-rock's finest (no credits, but I'm betting that's Paul Harris on keys, for one), and taking the tune at a brisk but still contemplative pace (kudos to that drummer), all the song's atmosphere rises and audibly fills the room. And Blue's singing, strangely, sounds better live than he usually sounded in the studio. THIS is the DEFINITIVE VERSION of one of the GREATEST FOLK-ROCK BALLADS of the SIXTIES! OK, I'll calm down. The second tape is from England's sweetheart, the poor, late great Kirsty MacColl. This tape, from a BBC broadcast, finds her at the Guinness Fleadh festival in London in '93, at one of my favorite points of her career -- having just released Electric Landlady but still doing plenty of stuff from previous album Kite . The EL songs sound great in live band format, especially "Walking Down Madison", in contrast to the more studio-bound sound of that album. And her personality shines through in her stage banter as well. R.I.P. Kirsty. Thanks to the original posters -- hope you guys don't mind me linking to ya -- not to mention the original tapers! Especially whomever hauled some no doubt clunky recording equipment down to the Unicorn Coffee House in December of '67 -- you were a visionary! Scoot on over and enjoy these two stellar examples of The Rare Stuff! If you recommend it, I will check it out. Both should be interesting. Thanks for the vote of confidence, Ace. If you like, come back and tell us what you think of 'em after you take a listen! I got a single by this guy called You Don't Need A Thing many years ago that I always really liked, but I never went any further. This is very cool. These 23 Days In September is really beautiful, Tastes Like Candy sounds like some lost garage psych classic. What a great band! Thanks for something I never knew I needed! reserv - so glad you liked it! Blue's later album, Stories, is well worth checking out. Very reminiscent of a Leonard Cohen album, and at times almost as good.